the protocol of shuffling cards for the dealers could use abit of adjusting to save time. currently they mahjong the cards -> riffle -> fan out the cards -> riffle somemore - > cut deck. the fanning out of the cards can be taken out as it serves no point. I thought the venue was great..comfortable and spacious..though i felt we could squeeze in more tables but I guess the weight consideration is imperative..
Free drinks and cheap beer was a nice touch too. Definitely needs better, faster dealers. The journey to LW was shorter than LJ or BEC..so that is also a win...got on the 5pm ferry and docked at 6pm. First up congrats to all winners, Well done organizers! Great job! The atmosphere was buzzing with kakis- sure I had a lot of fun. But even with those minor gripes it was a weekend well spent thanks to kakis and poker..
One more time..well done PK team..
BTW when is the next one? Thanks for the pokerkaki team for the fantastic organisation. 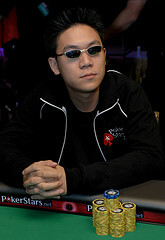 I must say i have been looking forward to this one since the last long jie tourney when i first started playing poker. Waited a long time for this & hope the next wont be too far away. You can almost feel the adrenaline rush of playing with all the big local players (and some regional luminaries) of the poker scene. Was very disappointed not to do better in the Main event final table, I was playing in the last MPC side event and was also the first to bust out of the final table. Feels damn sick to consecutively first one to bust out FT, so was a relief to take down the re-buy. p.s. Thanks Bryan and UB for the encouragement. Apologies to Daniel Chua, you outplayed me but i got lucky with the 3 outer river. 1) 9 handed play please, bigger and more tables and single flight if possible. 2) A bigger buy in for main event, i think its weird, main event has smaller buy in compared to the average buy in of the side event. buy in at $400-$500 will be better. If we have 2 flights, while 1st flight is playing, we can hold mega satellite ($80 to $100 buy in) to the main event. We can also play deeper stacks if single flight, starting 7k. And How about online sats in the future. 3) personally i prefer freezeout for main event & not 2nd chance. Busting out the same person twice just feels unreal in poker.. KO bounty in side event is fun too . 4) Bracelets to replace trophies. Last but not least, im very excited i can still access my starhub network while in Leisure world, no more roaming charges. this is a very pleasant surprise indeed! Last edited by MJFX on Sun Sep 26, 2010 2:29 pm, edited 2 times in total. A lot of the things you have suggested are currently in the pipeline and will be in time for the 2nd Series this Oct 23rd , 24th. If at least half your suggestions are not being met, look for me. I will be more than happy to buy you a beer. Looking forward to see you guys on board for the next event. Thanks once again for all the wonderful support you guys have given, details of the event i will leave it to the admin to announce shortly. Good idea! Will set it up now. Not sure why the turnout dropped for LW 2 series. We sure see a lot of new friendly faces, but many from the LW 1 did not return. maybe because of increase in buy-in? surely we wont mind reducing the main event buy in (from $400 to $250-$300) to accomodate more people? and how about morning SNG mega satellite to the main event? Team event doesnt seem very popular, i suggest bring in the KO bounty/ 6 max shootout to replace it. Oh yes, i enjoyed playing on the new bigger tables, more than enough space for 9-10 ppl. Some of the table felts were protruding out but still, not a big problem. just a suggestion. is there any way that the community can do to allow players able to use the $300 'rolling' chips that we changed for the rebate for ferry ticket to join the tourneys and SNGs on board? Was my 3rd tournament out of the 4th. First time ITM too. This is a good thing going and I will be sure to support it as long as i am not traveling out of SG. 1) The cards used are really hard to see. The suit is in the middle of the card! 2) Different chips should be used for different tournaments. The Rebuys event started at 9pm while the main event was still on-going. Same for the Christmas Bounty KO event. Not questioning the integrity of our fellow kakis, but its always better to be safe than sorry. 3) More Early Satelites or Freeroll events. They can be turbo so that winners will not miss the Main Event cut off time. 4) There should be 2 Main Event - 1 per day. The number of people dwindled in the 2nd day. There were not much incentives for those busted out in Day 1 to play in Day 2. To attract more people to stay, side events should have a much lower buy-in. 5) Day 2 events could have started earlier.